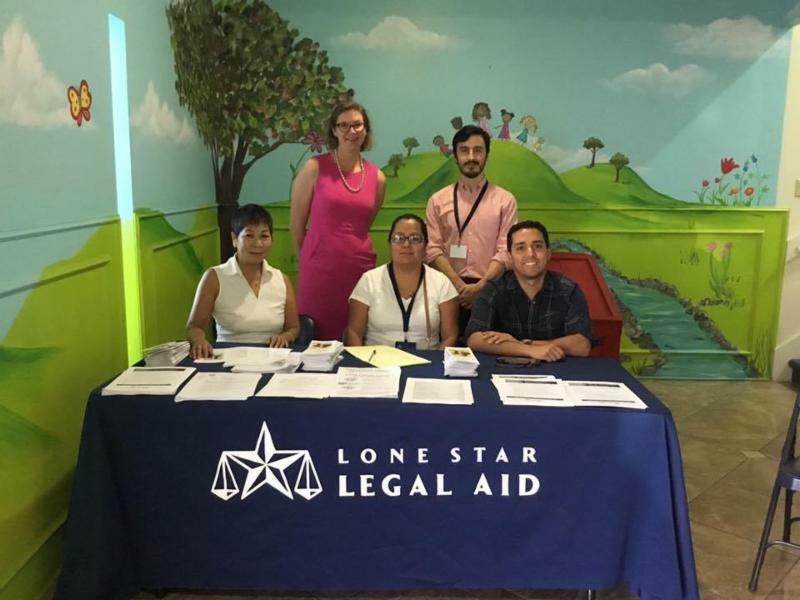 The Environmental Justice Team at Lone Star Legal Aid welcomes you to our second year of Environmental Justice News. We’re keeping communities updated on our team’s ongoing environmental law efforts throughout our 72-county service area. In our newsletter, you’ll find an overview of the types of legal cases we’re currently handling for eligible individuals and organizations who are living in fence-line communities and other areas where environmental justice is a concern. If you have an environmental legal matter that concerns you, please call 713-652-0077 ext. 8108 for more information on how we might be able to help your neighborhood. 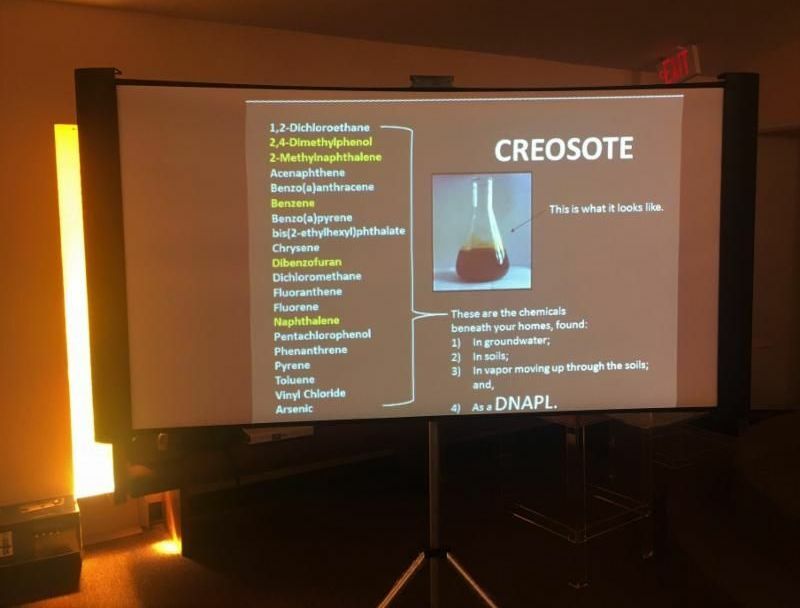 “ Creosote is a substance that is widely used as a wood preservative. It can be hazardous to your health if you are exposed to high levels or for a long time," stated the matter-of-fact but ominous introduction to an educational brochure produced by Texas Commission on Environmental Quality (TCEQ), titled, "Creosote: What Is It? What Are the Risks?" . At a recent community meeting, the IMPACT community group shared stacks of brochures and other educational materials with friends, family and neighbors who gathered together at True Love Baptist Church in Houston's historic Fifth Ward to voice their concerns about legacy contamination near Union Pacific's Englewood Yard, where a former coal tar creosoting facility, Houston Wood Preserving Works, treated railroad ties and telephone poles in open, unlined pits filled with the toxic substance for more than 100 years, contaminating the surrounding residential neighborhood and groundwater. During the meeting, LSLA Environmental Justice attorney Rodrigo Cantú talked about the extent of the contamination, while an expert hydrologist phoned in from Arizona, providing a detailed picture of the underground contaminants. Cantú shared information about how community members could take part in the public participation process on a Hazardous Waste and Compliance Plan that Union Pacific Railroad has been attempting to renew and modify through TCEQ and its predecessor agency for the past 15 years in back-and-forth negotiations. Required for the long-term storage and mitigation of the hazardous waste, the permit, also known as a Resource Conservation and Recovery Act (RCRA) permit, is currently open to public comments through the state agency. "Everyone is welcomed to submit a public comment to TCEQ during this process," shared Cantú, "even if you signed a restrictive covenant with Union Pacific." 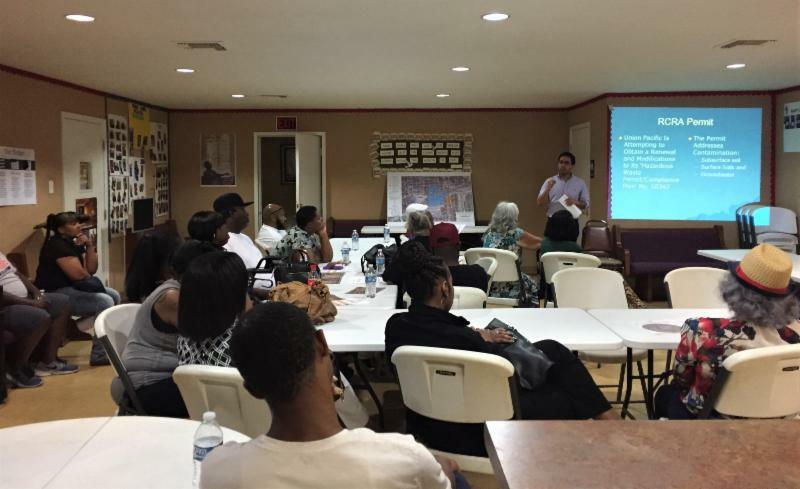 Dedicated to raising awareness around environmental and health issues in their neighborhood, the IMPACT group first began hosting community meetings like this in the summer of 2018. Co-hosted by The Reverend James Caldwell of Coalition of Community Organizations (C.O.C.O.) and LSLA community partner, Texas Housers, neighborhood interest in the creosote contamination has steadily grown over the past year, while additional residents have joined the group in order to make a difference in their community. "We want the contamination to be cleaned up so that people here will stop getting cancers and skin diseases," shared Sandra Small, one of the group's founders, "We want to see Union Pacific and TCEQ take some kind of action that will benefit the entire community." Represented by LSLA's Cantú, the group submitted public comments to TCEQ in December 2018 along with another LSLA client and long-time Fifth Ward resident, Anna Ortiz. The group and Mrs. Ortiz have requested a public meeting and a contested case hearing in order to challenge the permit, which they say poses an unreasonable risk to community members who have already been suffering from the carcinogenic effects of the pollutants for decades. The company has failed to obtain restrictive covenants for all private properties whose groundwater is known to be contaminated by the plume. Without these, Union Pacific cannot be granted its permit by TCEQ. Also known as coal tar, the health effects from long-term exposure to creosote include cancer, respiratory diseases and skin rashes, among other health issues. Concerned about the legacy of contamination, community members note that area residents have suffered a startling number of cancer cases over the years. "My whole street died of cancer," shared IMPACT member Leisa Harris Glenn, who grew up less than a mile from the creosoting facility. Glenn recalls a huge explosion that precipitated the shutdown of the facility in the 1980's. Sending debris throughout the neighborhood that looked like "little brown diamonds," the explosion left a crater in the ground as wide as a football field. The fire was so massive it burned for days, lighting up the night sky as if daylight. "The smell was just horrible," shared Glenn. Shortly after the incident, the tap water in neighborhood homes began running brown, a layer of creosote floating on top. “My mother was single with 5 children – so we could not afford to buy bottled water,” shared Glenn. “And nobody came to bring us bottled water. My mother had to cook with that water.” Glenn’s mother passed away of cancer before reaching retirement age. Leisa herself has sought medical treatment for stomach problems for years. Her sister passed away of a cancer that wracked her body with over 100 tumors, doctors informing the family that the tumors were too numerous to remove. In order to share their compelling stories with a wider audience, the IMPACT group recently began working on a video campaign with the help of Texas Housers. The group looks forward to sharing their video stories soon on social media, including on the group's new Facebook page . “My clients want Union Pacific to do a more thorough job of cleaning up the groundwater in residential areas surrounding its site. The community should not have to accept contaminated property as inevitable simply because Union Pacific is doing the bare minimum in pursuing the renewal of its permit,” reflected Cantú. ﻿TCEQ is currently accepting public comments on Union Pacific Houston Wood Preserving Works Hazardous Waste and Compliance Plan for the RCRA permit (#31547 and #50343) . Public comments, including requests for a public hearing and/or contested case hearing, will continue to be accepted by the agency until 45 days after the second newspaper publication of the Notice of Application and Preliminary Decision (NAPD), expected sometime in the first quarter of 2019. Members of the public may view and inspect Union Pacific's permit application documents which are available at the Tuttle Library, 702 Kress, Houston, Texas 77020. Working with LSLA group client Port Arthur Community Action Network (PA-CAN), Lone Star Legal Aid advocate Amy Dinn has tracked Texas Commission on Environmental Quality’s (TCEQ) enforcement responses to two major environmental releases that took place in Port Arthur in 2017. The first release was a silo fire at the German Pellets wood pellet facility at the Port of Port Arthur that suffocated the Westside of Port Arthur with black smoke for over two months straight. The second release occurred during Hurricane Harvey when a local gas station on 19th Street released an unknown thick, oily substance into the flood waters, damaging residents’ homes and property and leaving telltale signs of its presence behind long after the flood waters receded. Arguing that TCEQ's enforcement response to these events has been woefully inadequate, PA-CAN has requested that penalties be increased in order to address the gross negligence and harm done to community members living in the historically under-served Westside neighborhood. 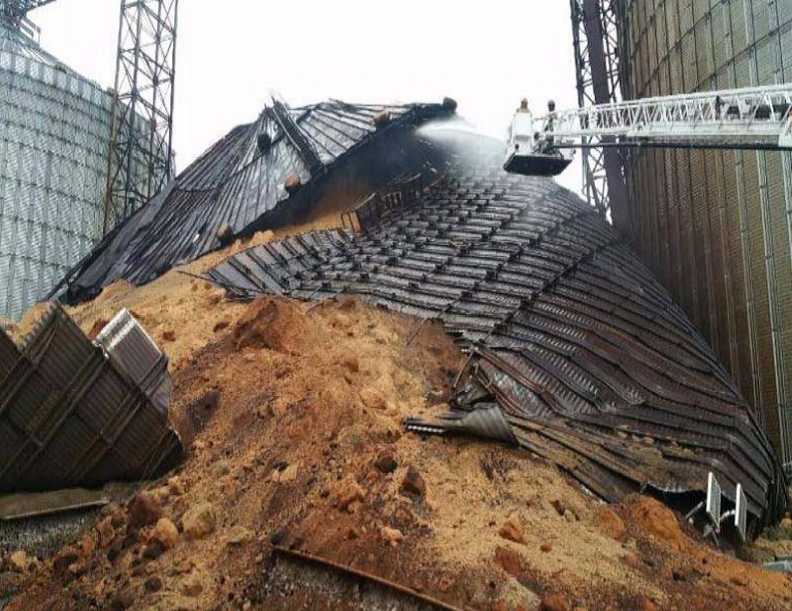 On April 15, 2017, a silo caught fire at German Pellets’ Port Arthur facility when fine particles of dust self-combusted due to improper storage of wood pellets in the poorly ventilated silo. The fire burned for more than two months, filling the Westside neighborhood with smoke. 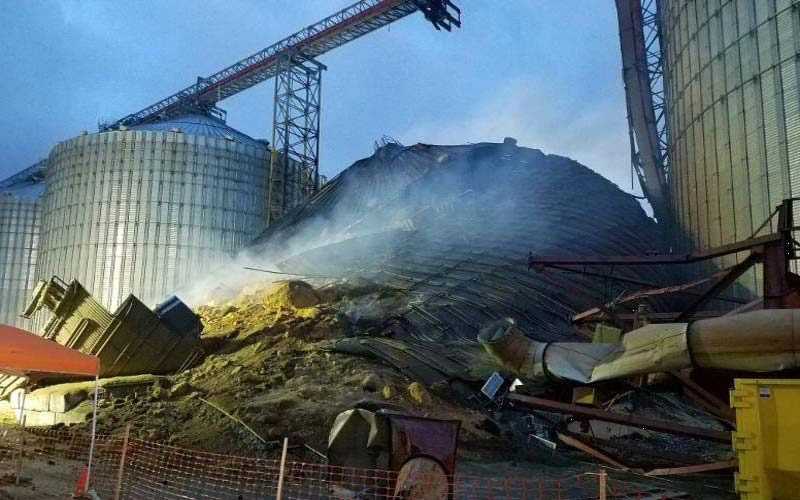 Ten thousand tons of wood pellets smoldered day and night, saturating residents’ homes, cars and personal belongings with smoke, while a public health crisis ensued. Dozens of community members were hospitalized due to respiratory problems. The TCEQ issued a shelter-in-place warning advising children, the elderly and people with heart and lung problems to stay inside with their windows and doors shut as much as possible. Many residents were forced to leave the city because the conditions were so horrible, and an elderly woman died in her home from breathing difficulties before relatives could arrive to retrieve her to safety. The silo eventually collapsed, while firefighters worked around the clock to put out the blaze in one of the longest disaster responses in the city's history. The City of Port Arthur sued German Pellets in June 2017, citing the company's "failure to prevent a fire, failure to remediate smoldering wood pellets, and multiple failures to maintain structural integrity of the affected silos and other structures," noting that the damaged structure posed a hazard to neighboring communities. Months later, a German Pellets employee was suffocated and killed during cleanup operations, as pellets collapsed on him while using a front loader. During Hurricane Harvey’s massive flooding that dumped 64 inches on the Westside neighborhood in early September 2017, the second release in question occurred when a local gas station on Savannah Avenue near 19 th Street accidentally released an untold amount of waste oil or a similar oily substance into the flood waters from a breach in its underground storage tanks. The spill migrated onto residential properties, contaminating homes and yards on 19 th Street, leaving a thick, black muck behind. Neighbors experienced severe health issues from the pollutants, which left a lingering smell. 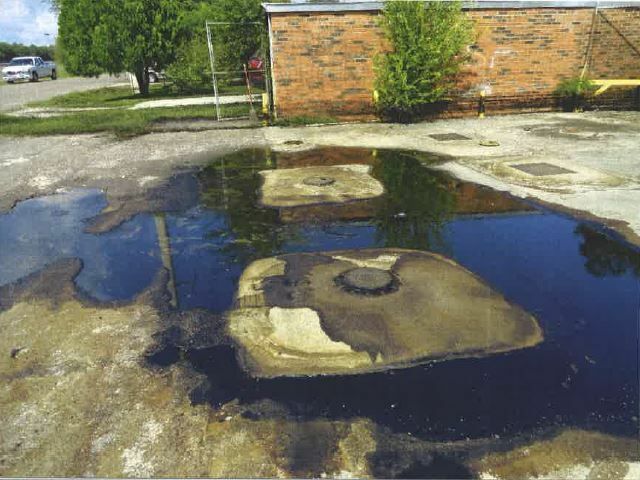 Although TCEQ ordered the service station owner to clean up the hazardous residue after the breach, much of the oily mess remained on neighborhood properties for months, as the owner repeatedly and dishonestly reported to TCEQ investigators that the spill had been cleaned up. Residents say the owner has never apologized or acknowledged their suffering, and no report was issued explaining exactly how the release occurred, leaving residents uncertain about whether such an event could happen again in the future. TCEQ’s enforcement process begins when a violation is discovered during an inspection on site at the regulated entity’s location or through a review of records conducted at TCEQ offices. When a violation is serious enough to warrant an enforcement action, the agency is authorized to enforce corrections of the violation and to seek penalties in order to deter future non-compliance. Penalties can be assessed either through administrative orders issued by TCEQ commissioners or by referral of cases to the Office of the Attorney General for enforcement through the courts, including potential civil penalties. The two releases in question were referred to TCEQ for enforcement in 2018, resulting in fines assessed through administrative orders by the agency. In mid-November 2018, TCEQ published its proposed administrative orders for the events in the Texas Register, with fines based on settlements with the companies. And the amounts were startlingly low. Observing only 22 "nuisance days" for German Pellets’ months-long catastrophic silo fire that caused lasting impacts on Westside community members, TCEQ assessed a mere $15,000 in fines, grouping the continuous days of damage into just 4 days of violation. For the Savannah Food & Deli violations related to its Harvey release, damaging residents' property and subsequently acting in bad faith, the agency assessed approximately $20,000 in fines. Prompted by the underwhelming fines, PA-CAN submitted 72 pages of written comments to TCEQ in December 2018, criticizing the agency's enforcement actions and requesting that penalty amounts be increased. Analyzing TCEQ's departure from its own published Penalty Policy last updated in 2014, the group argued that German Pellets should have been fined between $165,000 and $765,000, given the duration of nuisance conditions and the severity of health impacts experienced by residents. Citing German Pellets' gross negligence in its response plan during the disaster, PA-CAN's comments noted that "...representatives (of the company) could not even produce a working 1-800 number to answer the public’s questions or take complaints regarding the daily injuries that they were inflicting on the neighborhood," while the company appeared "callous to concerns of the community and simply focused on its ability to save and preserve its product stored in the silos..." Recalculating TCEQ's fines for the 19 th Street gas station release during Harvey, PA-CAN similarly showed that if correctly assessed, fines for that event should range between $273,750 and $1,815,000 given the severity of damage to neighboring properties and duration of time it took for the owner to report the violation to TCEQ and remediate the site. TCEQ has yet to respond to the group's comments. The ultimate fines generated from these enforcement actions will go into the State’s General Revenue Fund. Unfortunately, in most years the majority of fines assessed do not directly benefit communities that have been severely impacted like Port Arthur’s Westside. The Texas legislature requires TCEQ to prepare an electronic enforcement report by December 1st each year, including statistics on the number of investigations, number of notices of violation (NOVs) issued, number of enforcement actions, type of enforcement actions, amount of penalties assessed, deferred, or collected, and any other information that the Commission determines relevant. In 2018, TCEQ enforcement efforts resulted in 1,370 administrative orders issued, with over $7.5 million to be paid as penalties and over $3.9 million to be expended for Supplemental Environmental Projects (SEPs) – projects approved by the Commission to benefit the local Texas communities where environmental laws and regulations have been violated. Through the SEPs, violators are allowed to earmark a portion of their penalty dollars to benefit the affected community, rather than paying the entire penalty amount to the State’s General Revenue Fund. ﻿Considering the realities of the State legislative process, PA-CAN’s Chairman John Beard expressed further concern that the SEP process does not include enough community involvement to determine which projects would benefit communities the most, leaving communities like Port Arthur’s Westside wanting more from the State’s enforcement process. On October 26 th last year, the US Army Corps of Engineers published its 442-page Draft Integrated Feasibility Report and Environmental Impact Statement (DIFR-EIS) for the Coastal Texas Protection and Restoration Feasibility Study, also known as the Coastal Texas Study. 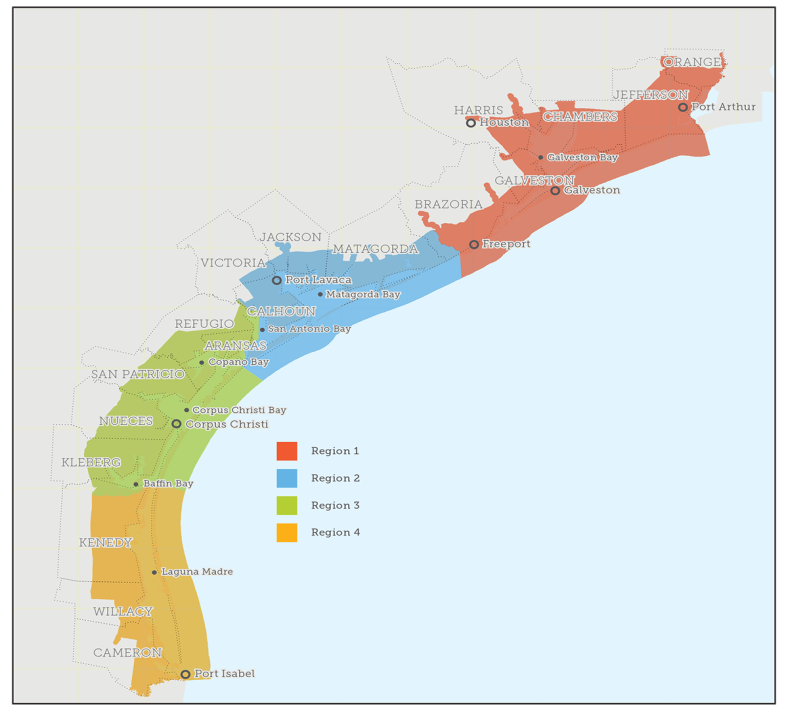 Initiated by USACE in November 2015 in partnership with the Texas General Land Office (GLO), the five-year Coastal Texas Study considers the feasibility of constructing a series of large-scale coastal storm risk management projects and ecosystem restoration projects meant to form a multi-pronged approach to protecting communities against future storms along the Texas coast from Brownsville to Port Arthur. 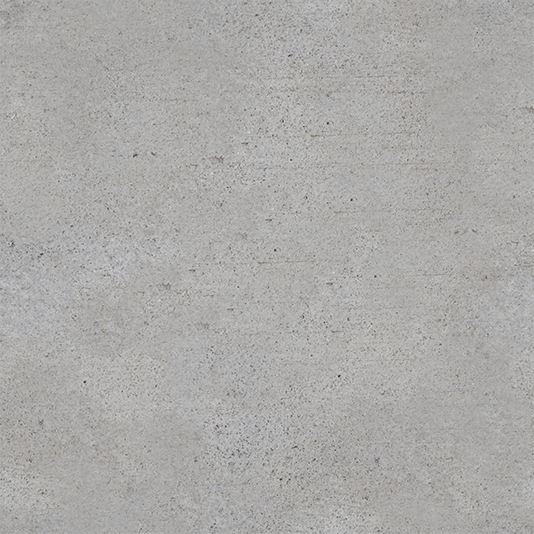 As part of the Coastal Texas Study DIFR-EIS, USACE indicated its support for the $31 billion Texas Coastal Spine project, commonly referenced as "Ike Dike," a 70-mile long concrete barrier that would run the length of the coast from north of High Island along the Bolivar Peninsula and Galveston Island all the way to San Luis Pass, along with a concrete levee that would be constructed around Galveston Island to protect the bayside of the island and a system of storm surge gates placed at the entrance to Galveston Bay in order to protect coastal residents from future storm surge events like those occurring during Hurricane Ike. As required under the National Environmental Policy Act (NEPA), USACE held a series of public meetings in December 2018 along the Texas coast, leaving many wondering about the fate of their communities. At one public meeting in Jamaica Beach , the mayor, city officials and residents expressed dire concerns about the proposed placement of the storm surge barrier, noting that the tentatively selected plan discussed in the DFIR-EIS appeared to leave the the entire community unprotected from storm surges, a line drawn on the map showing the town's fire station, grocery store, sole gas station, post office, two churches and city hall in front of the barrier. And the project’s long-term impacts on Galveston Bay appear to be uncertain at best, given the scant details provided in the DFIR-EIS. "We just don't know what effects this will have on the salinity and health of the bay," said long-time bay area resident, shrimp boat captain and LSLA client, Roy Lee Cannon. LSLA Environmental Justice advocates are representing Cannon and three additional group clients in communities that expect to be impacted by the Coastal Texas Study, including Freeport, Port Arthur, and the Houston Ship Channel area. More information on the study is available at coastalstudy.texas.gov . The Final Integrated Feasibility Report and Environmental Impact Statement will be complete in 2021. On Friday, January 25th, EJ Managing attorney Amy Dinn and LSLA Communications director Clarissa Ayala had a chance to sit down and talk with Steve Gallington and Richard Hanna, hosts of The People's News on KPFT, 90.1 FM radio. The two talked briefly about major infrastructure projects affecting our region; the EJ team's successful fight against a proposed 27-acre brine pit in Houston’s District K; and how the government shutdown affected social justice in Texas. The show can be downloaded as a podcast from the January 25th KPFT archives . Stay tuned for more Environmental Justice talks on future KPFT broadcasts! 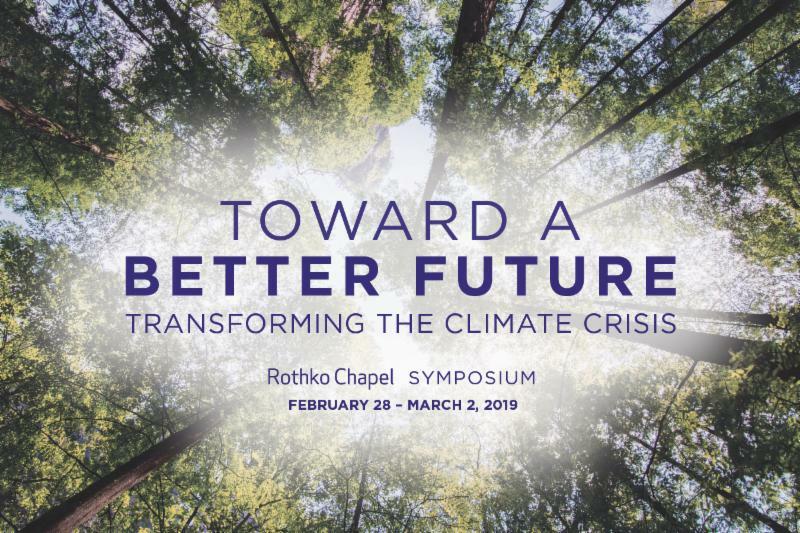 Join the Rothko Chapel and University of St. Thomas for a three-day symposium exploring the current climate crisis, its impact on vulnerable communities, and mitigation efforts being implemented locally and nationally. Scholarships and student discounts are being offered for this event on a first-come, first served basis . For more info on scholarships and student discounts, please contact: kelly.johnson@rothkochapel.org or 713-660-1403. For more information on upcoming EJ Team presentations or meetings, please contact our EJ Team at 713-652-0077 ext. 8108.